Is it chaining for gold necessary? ...."If you are not methodically searching for gold by chaining or gridding for gold you will CERTAINLY leave gold for the next person!! Make sure you use the following chaining for gold (or gridding) techniques when you search for gold with a metal detector. You want to get it all and leave nothing for the next person! We would also like to caution you on the limitations of Mono Coils and Pulse Induction metal detectors. Dont just think that because you have the biggest and best coil or PI detector you will get all the gold. If you use the incorrect detecting technique or an inefficient search pattern you will almost certainly miss some gold - particularly small gold but also larger gold nuggets on the peripheral of the detecting power of the metal detector. How often do you hear someone say, "I Found the nugget right in the middle of a chained area!". I know Udo and I have found plenty of gold in between chained lines. Here is some photos of a chained area where gold was subsequently found. Click on the Picture to enlarge the Photo. Missed Gold In Chained Area. More Missed Gold in chained area at Cue. - Click on the Picture to enlarge the Photo. See the chaining lines... and the stick in the ground. that stick is where gold was found after an area was previously chained. A lot of smaller up to 2 gram nuggets were found in this same area. The last picture I went prospecting in Cue found an area where someone has recently been chaining for gold and immediately found a gold nugget in their chain marks. Maybe a badly tuned or older metal detector. Lack of patience in the Detector Operator. Who knows, but dont let that happen to you and remember that wherever you see chain or grid lines then it may be an indicator of previous gold and it is worth looking at the area again. Here are some chaining and gridding techniques and steps you need to take to get all the gold! What is Chaining or Gridding an Area for Gold? There is only two things you need to know about chaining for gold. Work out the pattern best suited to the area you want to detect for gold. Have a method of marking off the grids. Basically this is just a walk through the bush or gold field zig zagging as you go in the hope that you will pick up the first piece of gold and start some form of disciplined chaining. 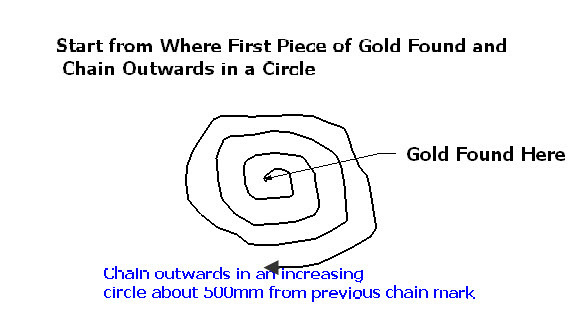 With this method you chain in a spiral pattern radiating out from the starting point which may be the first piece of gold that you found. As you find more pieces of gold you can get a pattern of its distribution and from that maybe target the source. One problem with this method is that you create a wedge shape detecting pattern on the outside sweep and it is easy to miss overlapping your sweeps of the coil which can lead to missed gold! This method is pretty basic. You start from the point where you found gold and grid up and down from that point. After you finish gridding up and down in the North South Direction you chain at right angles in the East West direction. That way you will miss no gold at all. It takes patience but why leave gold for anyone else? By the way, your grids should only be as wide as it takes so you can cover your previous chaining line with the metal detector sweep when you go in the opposite direction! ...and dont forget to change coils after you finish chaining so you get all the gold. For Example, Change from a large diameter coil where you have been finding deep gold nuggets to a smaller coil to mop up all the small gold pieces. 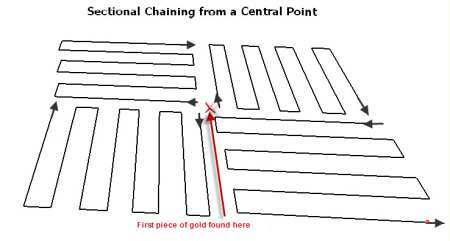 With this method of chaining for gold you start where you found your first piece of gold and grid a quadrant on the North West side, then the South West side, the South East Side and the North East side. The idea behind gridding is to ensure you cover all the area where there may be gold in a methodical way. 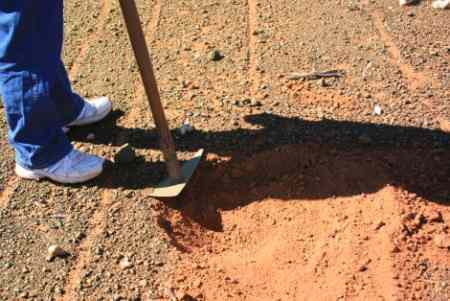 It is also good idea to mark the holes where you get gold with a stick or marker so you can get an idea of the distribution of the gold you have found. This will help you easily see any patterns in the way the gold is deposited so you an analyse where the gold is originating. For example the gold you are finding may be forming a classic fan pattern shape that leads to up a slope to the source. You never know, this may lead to the mother lode!. If you do mark the locations of gold make sure to remove the marks, discuise any holes and any evidence of chaining so you do not alert the next visitor where you have found gold. When the next generation of metal detectors arrive you will be able to revisit the spot and hopefully find more gold. The second aspect of proper gridding or chaining for gold is the method you use to mark off the area you have been over. It's up to you how you do this, just remember that if you leave marks in the ground or ribbons on trees that it is a beacon for any future metal detectorist to show them where gold has been found! With this method you drag heavy cord behind you that has a chain or heavy lead ball (or sinker) that marks the ground behind you. With this method instead of using a chain to mark your progress you mark the ground with your boots. It is not as efficient as using a chain. This method you use pegs at each end of the gridline and attach cord or surveyors tape to show your grid mark. After you complete one line you move it the pags and line sideways to the next gridline. 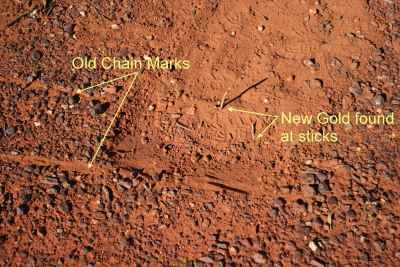 One advantage this method has is that you leave no chain marks to show people where you have found gold. Use markers along and at each end of the grid line. With this method you Place markers along the grid line at convenient distances apart and at the end of each gridline and detect along that line. Although it leaves no telltale marks this method is not as accurate as chaining or using string gridlines so you may not cover all the ground. Return to Gold Prospecting home Page from chaining for gold page.